On afternoons like Thursday, Albany has reason to be grateful for all those who, years ago, contributed and otherwise pushed to build the small waterpark at Swanson Park. With the temperature in the 80s and climbing, the place draws lots of kids, as you can see in this view from the Pacific Boulevard viaduct on Thursday afternoon. Most of them seem to be waiting on the steps of the 36-foot-high water slide. 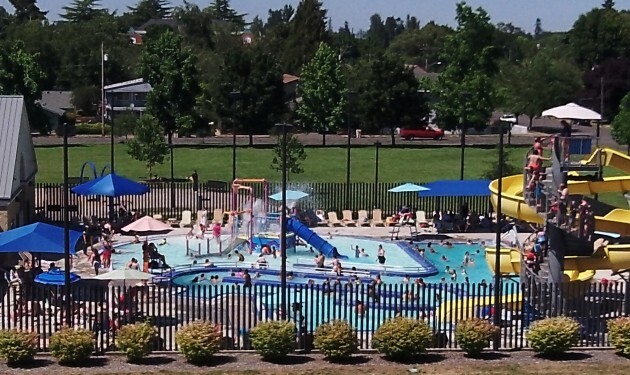 The Swanson waterpark opened in 2005, replacing an aging outdoor pool that had to be closed a few years before because repairs would have been too expensive. The idea for the waterpark came from Dave Clark, the city’s now-legendary parks director who died in 2002 at the age of 52. His successor, Ed Hodney, carried out the plans with great dedication and the help of donors and funding approved by the city council. 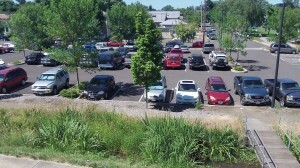 The Swanson parking lot: Obviously many didn’t walk to the pool. Well, this advice was ignored. The city instead, some time later, fittingly attached Clark’s name to the riverfront pathway Clark had also championed, among many other things. And it named the waterpark the “COOL! Pool,” a phrase I’ve never heard anyone use in conversation. An all-upper-case name, with an exclamation point no less, is not the only untoward aspect of the Swanson waterpark. It’s also kind of spendy. For kids 6-17 years of age getting in costs $3.25 if they live in the city, a dollar more if not. A season pass for a family of up to four is $250 in the city, $300 outside. In the Swanson neighborhood, I wonder how many residents have that much extra to spend. 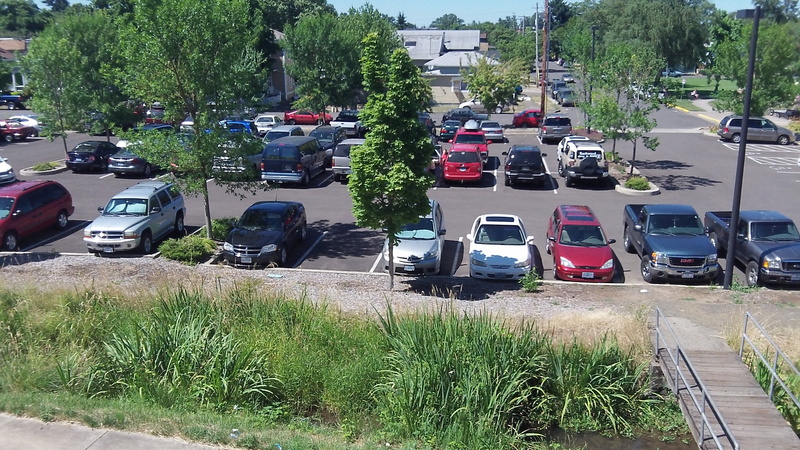 It’s no wonder some families take their kids to wade or even swim in the less than pristine waters of the Willamette or Calapooia rivers instead.